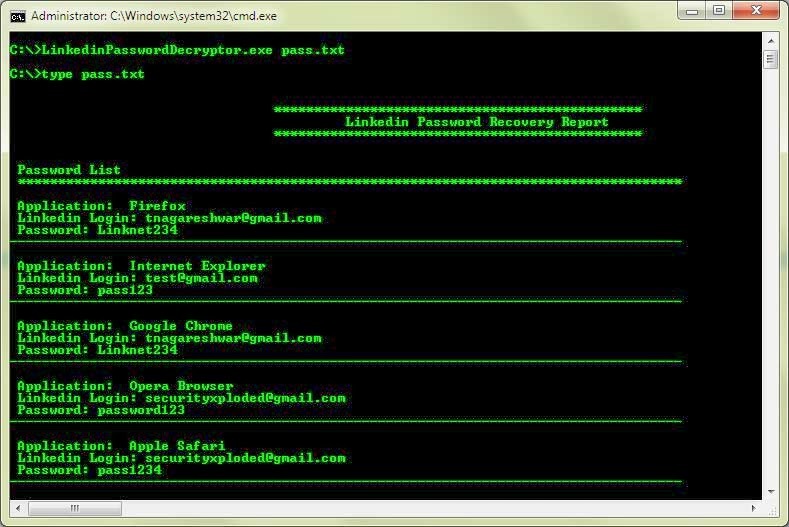 Linkedin Password Decryptor is the all-in-one software to recover Linkedin passwords stored by popular Web Browsers. These days, most of the web browsers store the website login passwords to prevent hassale of entering the password again and again. Each web browser use their own encryption mechanism and storage methods to securely store these login passwords including your Linkedin account passwords. 'Linkedin Password Decryptor' automatically crawls through each of these browsers installed on your system and instantly recovers all the stored Linkedin account password. It has both GUI and command line interface in one tool making it useful for Penetration testers & Forensic investigators.